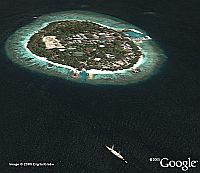 Part of the new Google Earth data update made last night, are a few excellent high resolution satellite photos of the islands around the Maldives. The Maldives are located southwest of India and look like a great vacation location. Three planes in flight have already been discovered in the area, and a nice "little" sailboat next to a real island paradise (as seen in the screenshot) . There are many high res islands to look at, and you can see many other sailboats enjoying the area. Check out the islands and see the placemarks for the planes and sailboat for yourself. The island shown is Bandos, I stayed there once, it was lovely. I am The Online Holidays Personal Travel ConsultantMaldives is the best diving and white sandy beach destination...none of my Clients who visited Maldives have had any complain plus most of the clients are repeaters..